The Fiber Optic Association is the international non-profit professional society for the fiber optic industry. More about the FOA here. (C)1999-2015, The Fiber Optic Association, Inc. STEM or STEAM – science, technology, engineering, arts and math – is the key to future success (and maybe survival) for everyone, especially students in schools today. These subjects can be complicated and confusing to some students – we like to quote science fiction writer Arthur C. Clarke who wrote 2001, A Space Odyssey, who said "Sufficiently advanced technology is indistinguishable from magic!" But like magic, these topics can be interesting and fun, if presented in an entertaining manner. It's our goal to introduce you, and help you to introduce your students, to the technology that makes much of the technology we use today possible – fiber optic communications – and show the STEAM topics related to it, including the arts – and make it entertaining and fun. Fiber optics is the primary medium we use to communicate today. 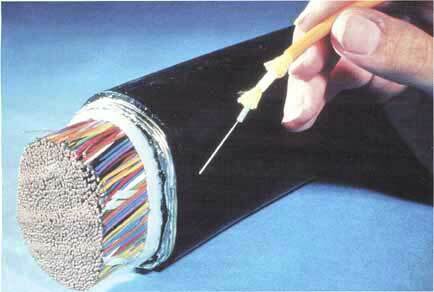 Phones, landline or wireless, the Internet and cable TV all communicate on fiber optic cables. Even when you are using your cell phone, it's not connected with a fiber optic cable, but the cell tower it's connected to probably is. Fiber optics carries signals as pulses of light while copper cables carry signals as pulses of electrons. As the photo below by AT&T from the 1970s showed, one hair-thin fiber can carry more signals than the giant copper telephone cable in the photo. Today's fibers can carry millions of times the data that that fiber could 40 years ago! 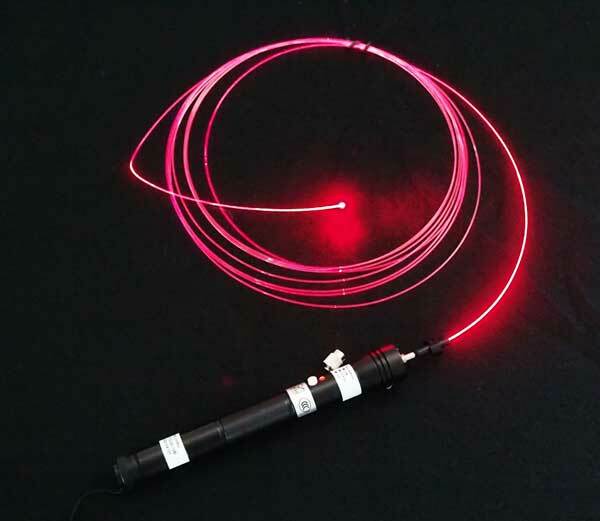 It's easy to demonstrate how fiber works - we can do it with a sample of plastic fiber and a laser pointer like the photo below and shown in the YouTube video "Fiber Optics For Teachers - An Introduction." Here are directions to do it yourself with the sample of POF. FOA has samples of this kind of fiber that we will send to teachers at schools in the US or you can find it at science distributors. Request a sample by sending an email to the FOA at <info@foa.org> with your name, the school where you teach and a mailing address. If you have ever wondered how you can download information from the Internet so fast or talk to someone anywhere in the world and hear them so clearly, it's mainly because the connection is over fiber optics. You are communicating at the "speed of light." Basically all communications (phones, the Internet, etc.) depends on fiber optics. Fiber has replaced copper cables, wireless and satellites for worldwide communications links as shown in the photo below. It's a NASA composite photo of the earth at night where lights show the centers of population. 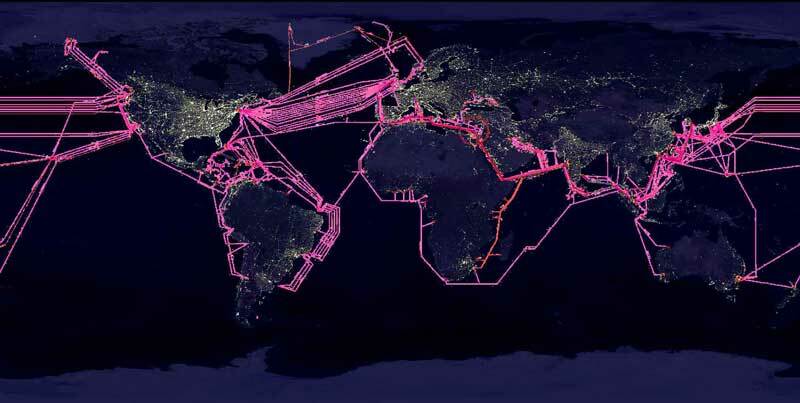 Overlaying a map of undersea fiber optic cables shows how they connect the places where the people are. 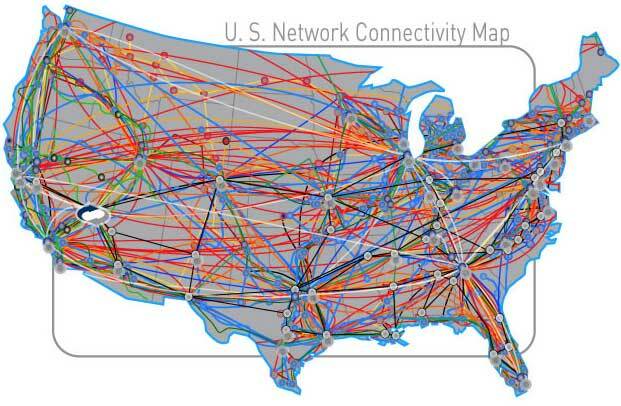 In the US, cables on the land connect all the population centers, providing the backbone for all phones and the Internet. Today, fiber is being used to connect homes directly - systems like "Verizon FiOS" and "Google Fiber" use fiber to connect the home with speeds up to 1 gigabit per second - that's one billion bits of data every second, fast enough to download a movie in seconds. The photo below shows a Verizon worker installing fiber to the home in Syracuse, NY. FOA creates lots of curriculum materials for our hundreds of schools around the world and much of it is appropriate for introducing students to fiber optics. 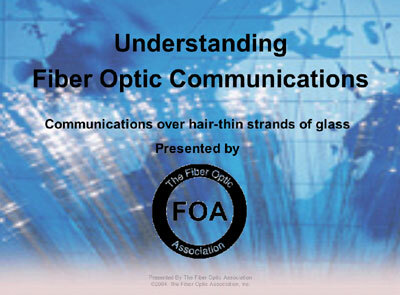 The place to begin is the FOA YouTube video "Fiber Optics For Teachers - An Introduction." It shows some demos you can do in the classroom and offers a sample of the plastic optical fiber for teachers. Here are directions to do this demonstration yourself with a sample of POF from FOA. FOA has a video about all the places where fiber is used - it's called "Where Are The Jobs In Fiber Optics" and it not only shows you where fiber is used but where job opportunities are for those interested in working in this field. Here are links to all the FOA YouTube videos. Here is a short PowerPoint presentation you can give to your classes yourself. It is aimed at introducing fiber optic technology to science or career education students and showing what career opportunities exist in the field. You can download this short introduction to fiber optics appropriate for any middle or high school class studying communications or general science. Download it here (PPT, 3MB). FOA Fiber Optic Science Project - created by a middle school student with the FOA's help, this project can be duplicated and expanded by science students for a class project or a science fair project. Here is a Lab Manual for a college or advanced high school program. It was developed by Professor Elias Awad of the FOA under a NSF grant. You can download it as a MS Word DOC file or a Adobe Acrobat PDF file. What else does the FOA offer for teachers? FOA Online Guide covers everything from the basics to advanced technology on the FOA website. It's about 1000 pages of technical information with it's own Google Search engine to help you find things. FOA has an Affiliate Program where we share educational materials with teachers who want to teach classroom and lab sessions on fiber optics as part of an IT or Telecom program. More information on the FOA Affiliate Program is here. Teachers at FOA-approved schools can offer the FOA CFOT certification. Want to know more? If you want to offer FOA certification in your program, FOA offers "Train The Trainer and Instructor Certification" Program. Become a certified fiber optic instructor and take home a complete training program. Looking For Fiber Optic Training? You can find a list of FOA approved schools that offer CFOT certification here on the list of FOA approved schools .